you would know that my hubby and I traveled to the Napa Valley, California area recently. Nightmare you say? . . . Oh I love my basket, but there is a story to tell you!!! to see the quaint town while staying at Calistoga Ranch. I spotted two antique shops that carried French imports. and the other had fine French antique furnishings and accessories. and saw many things that I would love to take home with me. via plane and I just cannot toss things in the car as I usually do. 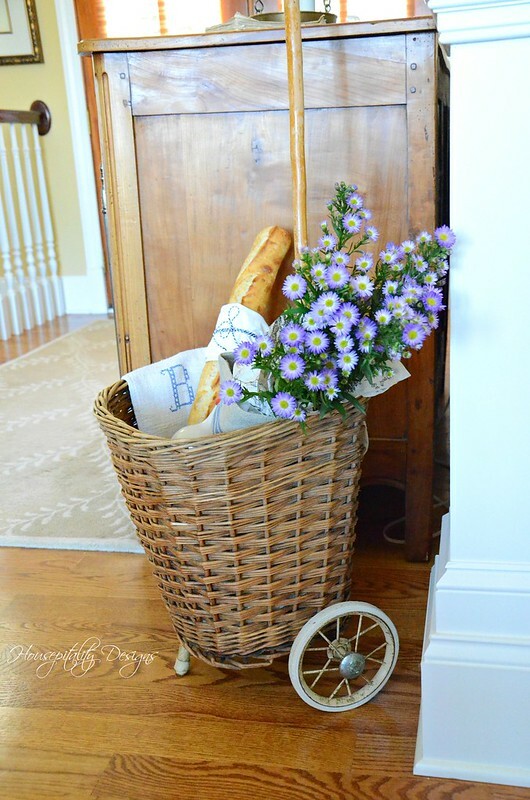 I came across this ever so cute French Market rolling basket. 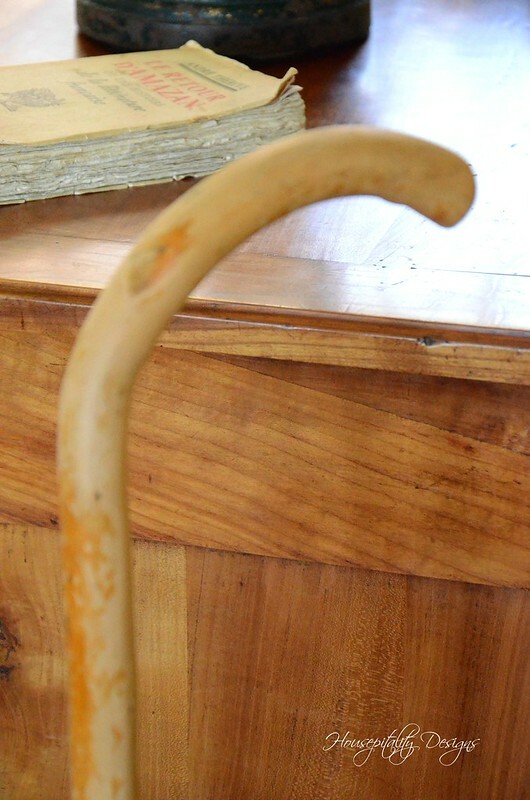 handle was an old cane. I loved the charm of this basket. I showed the basket to my hubby and he said, if you like it . . . we can have it shipped! It’s not a problem, he said, we can take it to the UPS store tomorrow. Just get it!! . . . Well, OhhhKay. . . . no arm twisting required. So, the next day, before our sightseeing adventures, we went to the local U.P.S. store. U.P.S measured and calculated the charges . . . . here is when the nightmare begins. What?!!!! . . . $225.00 to ship it?!!! Oh that includes the packing too . . what?!!! I was sick! . . . my $90.00 basket was going to really cost me over $300!!! So my hubby and I took a moment to figure out our next step. we could buy it a seat on the plane for less money! Then I had a light bulb moment. on oversized “luggage” . . . according to the measurements, the cost would be $100. rather well I should add, and off to the airport with us it went. 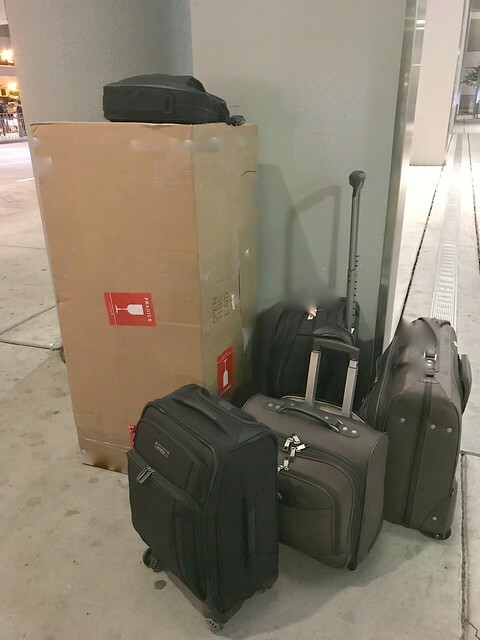 We checked some of our luggage at the curb prior to returning to the rental car area. Saved us from having to lug that big box through the airport. The “Sky Cap” said, that will be $200 for the box . . . What?!!! That is what the computer says . . . I whip out my phone and show him the charges on the website. and then eventually made it to the customer service counter. After speaking to the agent and 2 supervisors, they honored what was erroneously on the site. 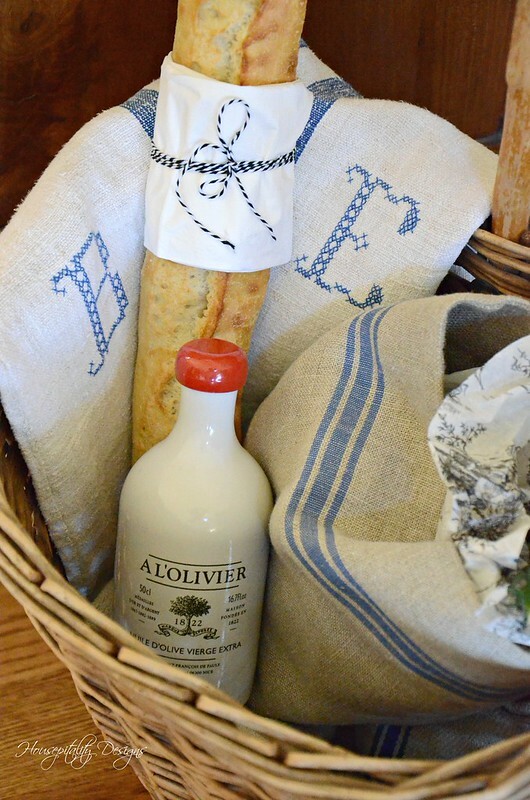 So how can this cute vintage French Market Basket cause so much trouble? Maybe . . . it was just meant to come home with me. is and very understanding . . .
and may I add that he did encourage me to “just ship it” !!! So that’s my shipping nightmare story. But in the scheme of life, it was just a mini nightmare! The morale of the story . . . if it doesn’t fit in your suitcase . . leave it behind! and spending time with my Sweetie while she is on Spring Break. Yes, shipping can be very costly. I’m glad they honored the price on line. That is a beautiful find! OMGoodness, I would have been upset to say the least at the shipping charges too! 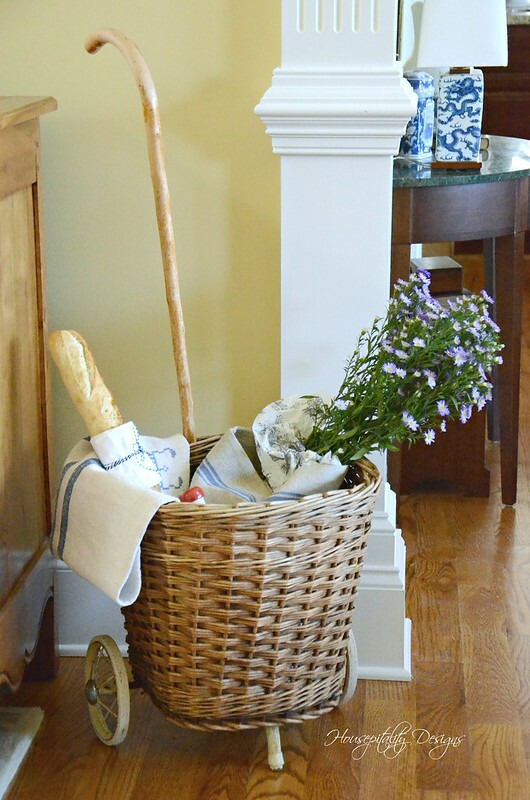 I am so glad it all worked out as the basket is PERFECT for you and in your home! Enjoy your sweetie!!! I miss mine, as she has been sick but will see her Thurs. Have a beautiful day!!! Your hubby is a keeper for sure. Afraid my hubby wouldn’t agreed for me to buy the market basket in the first place. It is just was the doctor ordered and looks like it was meant to be right where you placed it. So nice that you managed to get it home! I can’t resist a beautiful basket either. Awhile back I bought a large basket with a braided front. I could tell that it was old, but it was only priced at about twenty eight dollars, which I thought was too low for such a pretty basket, so I was happy to take it off their hands. When I got it home, I realized that it must be the top portion of a French-style market basket. It would look good hanging from a hook, as it has an arched handle, but I placed it on top of a sturdy kitchen stool. I plan to make a layered skirt for the stool. It looks so cute there and I enjoy the unusual braided front. I hope you enjoy yours too! I love your basket and I know it is appreciated for all you went through to get it home. Whew! That was stress. Your husband is very nice. These shipping charges have just gotten ridiculous!!! I was looking at something online yesterday and noticed the shipping would be nearly 3 times the cost of the item itself! NO WAY!!! You had already bought your beautiful basket, so there was no turning back. Your husband is to be lauded for his calm, and you both deserve kudos for your resolve. I remember honeymooning in New Orleans and finding a piece of framed artwork I just couldn’t resist. I had to lug that sucker back with not one, but TWO plane changes! And the first two planes were those little tiny jumper planes!!!! Of course, that was all before 911 and all the changes to carry on luggage rules. In this day and time, I’m sure the artwork would have cost us big time to ship home!!! I know you will get many great years out of that new treasure! Well worth the hassle! Shirley, this is a beautiful basket. Even though this was an ordeal to get home, it is well worth the effort and the basket will always have a story to tell! My husband would have insisted I bring it home too. All’s well that ends well. (And your persistence with the airlines paid off!) the basket looks beautiful , at home where it was meant to be. You have styled it beautifully, and just between us two, even if you had to pay the higher amount, your basket would still be a deal. 😉 It’s unusual, and a great size! You have styled it so beautifully, Shirley, I think it’s very happy in your beautiful home amongst your other beauties. I wish you a beautiful Easter, hope you get to celebrate the joy with your darling family Shirley. Nice French rolling basket! Shipping charges is crazy….I don’t buy if I can’t bring with me. That’s why I hate to fly anywhere. Glad you got them to honor their price which they should have! My hubby would have left it behind and chalked up the loss of basket! 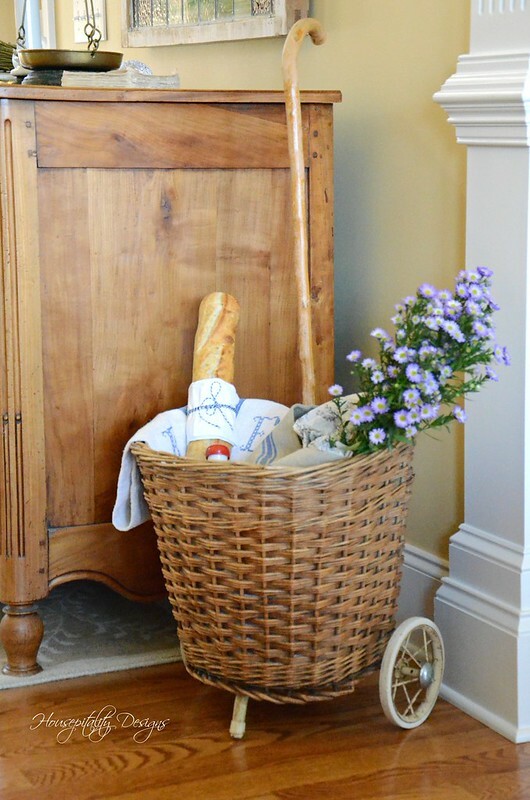 Glad there was a happy ending to your story and your French basket looks so beautiful in its new home! Wow…I knew shipping was expensive but had no idea it would cost that much so I will keep that in mind for the future. We rarely ever fly unless its a long trip. Even when we go to Florida from VA we drive. I love to go to antique shops,vintage stores and fairs and unless I found something very small it would be useless if we were flying. Have a wonderful Easter! Oh my! I do remember travelling in Arizona many years ago and finding an adorable epergne in a lovely store in Scottsdale called Enchanté. I had to have it! There were seven little glass vases held by little wire coils entwined with metal ivy leaves on a green and gold base. In those days stuff like that would be packed up as carry on and I carried all the way from Arizona to Ottawa, Canada!! I love that pretty flower holder but it must have been lonely…a couple years later my Dad appeared on the door step with it’s mate!! He had found it in a consignment shop in Toronto and knew where it belonged..I pair them on my dining room table or on the mantle filled with spray roses or carnations. Yes, somethings are meant to be regardless of the effort and cost of getting them!! Do enjoy your pretty basket, I could see a bunny sitting in it for Easter!! If you ever find its mate I hope it’s closer to your home!! Awesome story! I do believe the basket is meant to be in your home! Awesome husband you have there, too! He knows how to show love to the one he loves! 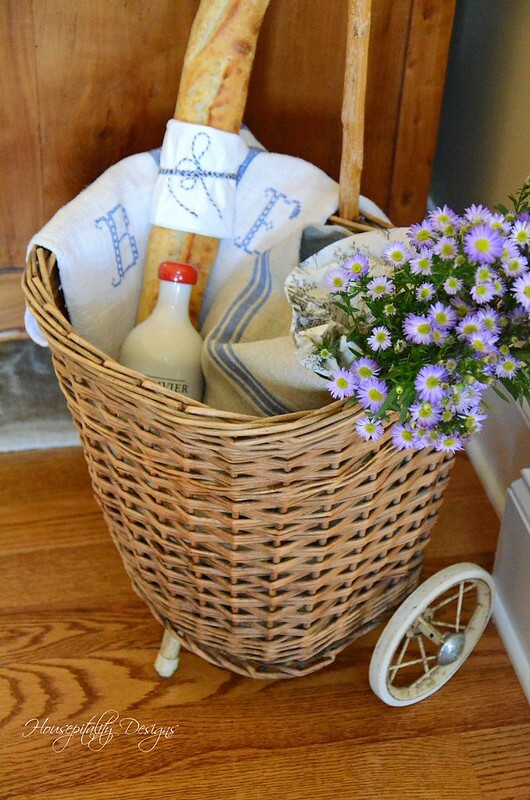 A great basket find even if it was somewhat of a nightmare, it looks great having a home in your home! Love it! Oh Shirley what a nightmare indeed. I have to say though it was totally worth the aggravation and expense. It looks beautiful in your home. Happy Easter. One that stands out was on a trip to Majorca and my three Lladros. We were in a volkswagen beetle. It was my husband , my two sons who were 10 and 6 , myself and 3 wks worth of clothing and other have to have. That was before all the good deals I couldn’t leave behind interfered. I ended up with two large boxes under my legs and one on my lap. We had to get on a ferry to Barcelona and then trugged back up to Germany via France. We had fun, but it was an adventure. Love your market basket. I have one but it taller and not an antique. Yours looks really nice with your blue linens. Well, it was definitely worth it! What a great French market basket! You have a very special husband! So happy it all worked out. It is lovely and definitely looks at home. All’s well that ends well! ouch! It’s adorable and I love how you have it styled. who would have thought it would cost that much via UPS. good thing you had your proof on your phone! Thank goodness, the nightmare ended well. 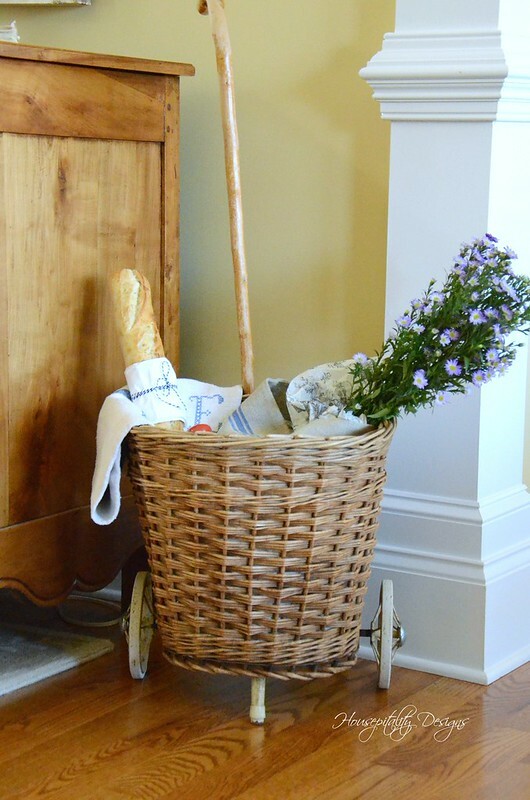 The rolling basket is a fabulous find and well worth your trouble! Flying is so difficult these days, not like it used to be! You styled the basket beautifully! Happy Easter! I love you market basket! I have always wanted one too. WOW with the shipping!!!! Darling basket! Nice find, yes to the nightmare shipping charges. Can anyone explain why they have skyrocketed? Fuel costs are not unusual- what has caused the spike? I’ve told family/friends that there will be no more shipping any little gifts etc- if it doesn’t fit into an envelope it doesn’t go. And isn’t that sad? I used to love to send small items (stationary, funny cocktail napkins, frame etc) to surprise those I love. Who doesn’t love to receive something unexpected? That is a gorgeous basket!!!!! Glad it all worked out. Hope y’all have a lovely Easter. Hugs! Well, your market basket provenance just got a little better. Enjoy it! I would love it too. But NOW it’s yours and that’s all that matters. Right after 9/11 I flew to a funeral out of state and while there I found a mini Tom Sawyer tree house. Put it in a bag, got on the plane and no one complained. Needless to say things have change. The expensive part of shipping is when they measure the box and enter the zip code. Shipping Christmas trees is expensive. UPS is more expensive than USPS. The following time I read a blog, I hope that it doesnt disappoint me as a lot as this one. I imply, I know it was my choice to learn, however I truly thought youd have something attention-grabbing to say. All I hear is a bunch of whining about one thing that you might repair if you werent too busy on the lookout for attention.